A hungry mosquito lurks nearby, evidenced by a high-pitched whining sound. If a female, her target is protein from blood, after which she develops eggs numbering up to 250,000 per season. 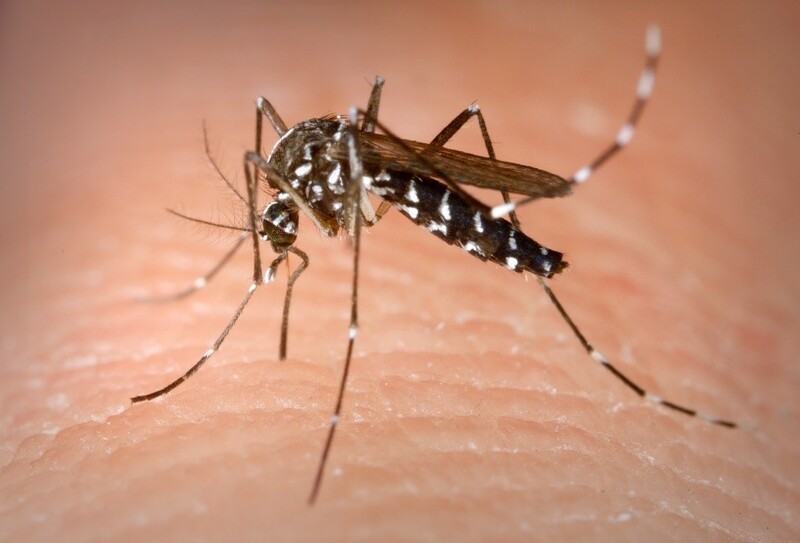 Her pesky bites cause incessant itching, but a greater concern is whether she carries a mosquito-borne disease, such as Zika or West Nile virus. “We have collected mosquitoes that test positive for West Nile virus every year since 2002,” said Randy Buchanan, environmental program specialist II for Henrico County. “But just because a mosquito is infected does not mean it is infectious for humans.” An infected mosquito needs time to replicate a virus before it can infect others. “We’re very fortunate in this region that we rarely see human cases of West Nile virus,” Buchanan said. According to the Centers for Disease Control and Prevention, Virginia had 13 confirmed human West Nile virus cases last year. Of these, three were in in the Central Virginia region with none in Henrico County, where Lewis Ginter Botanical Garden is located. Buchanan’s agency has identified 40 different kinds of mosquitoes in Henrico County. The region’s number-one culprit—at least for the last 15 years—is the Asian tiger mosquito (Aedes albopictus). Small pockets of water—sometimes found in folds of a woodpile tarp or grill cover, and in kiddie pools, abandoned tires, outdoor toys, objects stored under decks and stacked flower pots—are where the Asian tiger mosquito will lay eggs. Asian tiger mosquito larva also can be found in natural containers, such as holes in the side of a tree, indentations on rocks and leaf axils of bromeliads. A mosquito needs only 2 tablespoons of water to lay her eggs. When that water is left untouched for seven to ten days, adult mosquitoes can emerge and the cycle repeats. Pick-a-Day to Fight-the-Bite is the county’s program that reminds homeowners and businesses to monitor their premises and remove standing water that supports mosquito breeding. “Once a week, do a 10-minute inspection around your property to look for pockets where water sits,” Buchanan suggested. “Look for places where she (the female mosquito) can lay eggs. Dump the water, and she’ll leave your property. Just look for hidden pockets and make sure your neighbors do, too,” he said. “As far as pesticide applications, they should be targeted to where the mosquitoes are resting,” Buchanan added. Mosquitoes are pollinators just like native bees and butterflies, so they look for nectar meals among flowering plants. Indiscriminate spraying of pesticides around flowering plants will kill mosquitoes, but it may kill desirable pollinators, too. This practice can be especially detrimental in areas where native bees, butterflies, and honeybees are already in decline. Sugar bait stations set around flowering plants will attract and trap mosquitoes without harming beneficial pollinators. Adding a fountain or waterfall to a pond will keep the water moving so the mosquito breeding cycle is disturbed. Another option is an environmentally-friendly larvicide product, such as Bti (Bti is short for Bacillus thuringiensis subspecies israelensis), which targets mosquito larvae without negatively impacting aquatic mammals, birds or humans. Very fine screens (at least 1/16 of an inch mesh) can be used to cover rain barrels. Typically, mosquitoes (and sometimes other insects) are repelled by certain strong-scented plants, such as basil, lavender, mint, lemon balm, sage, and rosemary. Gardeners have been known to crush a plant’s leaves to release the aromatic oil, which they rub on their skin as a natural mosquito deterrent. Though somewhat effective, in mosquito-infested areas it is always wise to wear light-colored clothing—preferably long sleeves and pants—along with repellent spray. Henrico County performs complimentary mosquito inspections for residents and businesses in Henrico County. This article first published in the “Richmond Times-Dispatch,” in August 2018.